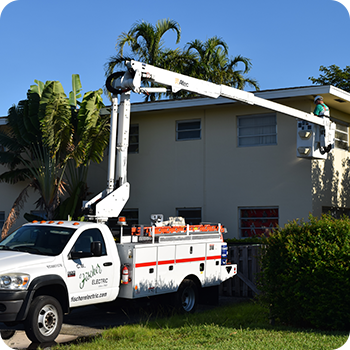 Fischer Electric can provide bucket truck service for many types of overhead projects and service work. Whether it is servicing existing site lighting, upgrading existing site lighting to LED, servicing other types of building lighting, or even installing Christmas lighting, we can handle all your overhead lighting needs. We also offer yearly service contracts at set rates and mark-ups to provide maintenance of site lighting and premises lighting. 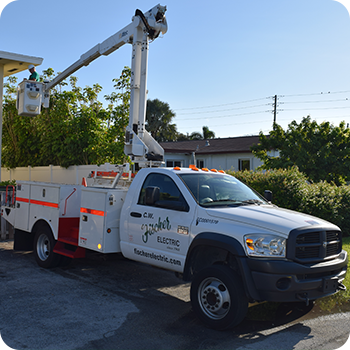 Service contract rates are negotiated up front and we provide a detailed list of services and mark-ups for material that will be charged. We will do a yearly visit to site to ascertain what is needed and take care of it without any need for customer to call, or we will provide service only when requested by the customer.